It is best to keep the story about antifreeze poisoning simple—put simply, it kills. Antifreeze, specifically ethylene glycol, is a highly toxic substance that smells and tastes sweet to pets and can cause serious, sometimes fatal health problems in both cats and dogs. If you use it in your own car, look for antifreeze formulated with other forms of glycol—like propylene glycol—and always keep it out of reach of your pets in sealed containers. If you live in a neighborhood where you allow your dog or cat to wander, make sure you do not use the ethylene glycol antifreeze and where possible, ask your neighbors to do the same. Check your vehicles regularly to ensure they are not leaking antifreeze as dogs and cats can be tempted to lick any spills from the ground and intaking a small amount can prove particularly fatal to cats. If you have a free standing basketball hoop that uses antifreeze in the base, make sure you use a safer version of antifreeze and keep the cap in place so your pet isn’t compelled to stick its nose in and drink it. The bittering agent that is added to some antifreeze can help prevent a pet from drinking this normally tasty sweet treat, but there are no resounding statistics that prove the incidence of antifreeze intoxication is reduced when this bittering agent is added. Antifreeze formulated with other forms of glycol—propylene glycol— are thought to be safer. 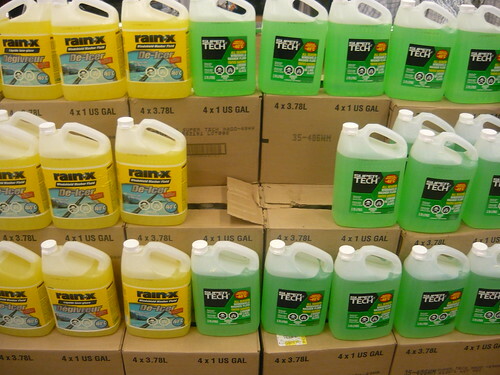 Antifreeze irreversibly destroys the kidneys, causing kidney failure. The damage is only preventable if treatment with an antidote is started within a few hours of ingestion. If you think your pet has ingested antifreeze, do not delay. Call your regular veterinarian on your way there and see if they can treat this type of poisoning. They may refer you directly to an emergency or critical care veterinary hospital. Symptoms of antifreeze ingestion include staggering, loss of balance, excessive water consumption, depression, seizures and death. If a sub-lethal dosage is ingested, the symptoms will be much subtler and kidney damage without full blown failure might result. This kind of trouble can take days to become obvious. If your dog or cat is already showing the symptoms of antifreeze intoxication it could be too late to save your pet—unless you have very ready access to advanced specialty veterinary care including an antidote, some form of dialysis, and potentially a kidney transplant, not to mention significant funds to pay for the care— at least $10,000 to $20,000. Now for the good news: Antifreeze poisoning is actually not that common. Maybe there are “more new cars with less leaks” on the road, maybe people are just more careful, maybe despite the research, the bittering agents are working, maybe fewer pets are allowed to wander unsupervised—but it’s no less important to look out for your pet this winter. If your pet does run into trouble, Trupanion can be there to help you get the best care for your pet. Antifreeze poisoning is one of the most common forms of poisoning in small animals, and this is because it is so commonly found in households. It is extremely important to consult your veterinarian as quickly as possible. Hi Calvin. Good news is that antifreeze toxicity does not make the “top 10” list of poisonings as reported by the ASPCA Animal Poison Control Center. I think there are very large regional differences but your point is spot on … get to your vet ASAP if you think your pet has been exposed!